Some undergraduates at the Nanyang Technological University (NTU) have had their interests and career choices profiled via a psychometric test provided by STJobs and C-Vat. 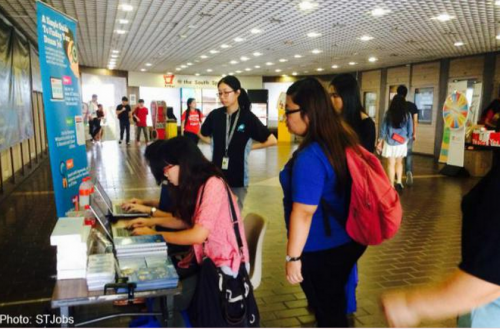 The psychometric tool was also used by more than 500 jobseekers at last month's STJobs Express Career Fair 2015. A total of 90 per cent of those who gave their feedback on the test commented that the accuracy of their profiling is "very accurate". NTU student Ms Shin Tham, 20, said: "This test seems fairly accurate and gives me a confirmed assessment of myself. It definitely helps me in making future choices, including my career path." Ms Shermain Cheong, 20, added: "I did the test to find out if it's different from other similar tests I've done before. Although the questions are different, the results are the same. It's certainly helps me make better, more affirmative decision about my choice of jobs in future." Senior Product Manager of STJobs, Ms Ang Yinghui, said: "Not only does the test provide an objective assessment and accurate profile of the candidate's critical thinking abilities, working style and his preferred corporate culture, it is also increasingly and commonly used by employers to qualify and assess a candidate's suitability for a specific job. This 360 tool is useful for both hirers and employees and we want to give value to our users by providing it - at no cost - via STJobs." STJobs plans to extend its outreach to other campuses. Meanwhile, members of the public can access the psychometric test for free at www.STJobs.sg (under the 'Tools' section) for a limited time only. At the end of the test, STJobs will recommend the user with a list of jobs. The test is available as long as one signs up for an account with STJobs. Users can also have their results analysed by professionals at STJob's upcoming Career Fair 2015, which will be held at MBS on July 4 and 5. There is no entrance fee but pre-registration is required. To try the psychometric test, log in here.